Today, by the powers and authority given to me as the Dad, I hearby declare the blog name today will be called 'Anna Update' in honor of her bravery and gift. She's out of surgery now and recovering form anesthesia. She was in there for about 3 hours. They has to take a bit more than the max that she can give because her stem cells weren't as densely packed as is typical. They ended up taking it from 5 sites. 2 in the back hip left side one in the back right and 1 from each side on both front hips. She's gonna be sore for a bit. The lab is spinning down the marrow and getting the stem cell separated. Right now, based on calculations, they are still below the amount they would like to have for transplant. But they couldn't take any more volume so it is what it is right now. If they needed they could always try to harvest more via peripheral blood but we'll talk about that with the doctor later once we know the final stem cell volume. She's a trooper. We're all tired and are just trying to roll with it. Abby's pains mostly under control for now, she's on a pain pump. The thing that really hurts is when she hiccups which unfortunately happens a lot right now. 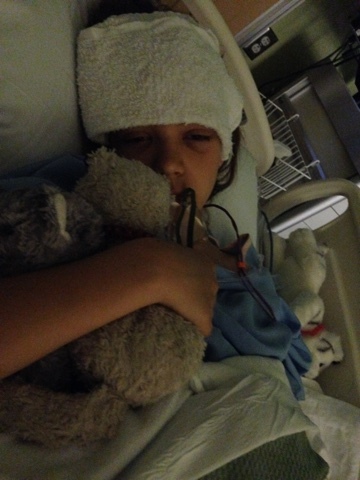 Later today she'll get an IV drip of Anna's Stem Cells where they will make a new home in Abby. If you test Abby's blood in a year, she'll have Anna's DNA. But if you cheek swab her, she'll still be Abby. I told her that she may have a future as a criminal mastermind. But, she didn't think that would be the best use of this gift. I agree as well. Let's just get her better. More later. Thanks for all the comments! Thanks be to God! And thanks, Anna, for being such a lovely sister to Abby. Just got home from Eucharist and the Healing Service at Good Shepherd where Father Joe said a wonderful prayer with me for both of you, and for all of your family. ope you both will see many brighter days in your futures. Your courage has inspired and lifted me. Kind of giving me goose bumps to think of all that is going on right now between Anna and Abby. We are amazing creations, so unique and yet so closely linked. I know Anna was excited, truly, to get to order up some hospital food! You have such a wonderful family, Mark. May God richly bless this entire procedure and you all! I love her cats. It's heart wrenching and amazing all at the same time. Love you guys! Anna, May you be blessed with healing from your giving in Jesus name! Anna, you did GREAT job! Otsukare sama! Our thoughts are always with you. Massive energy from Tokyo in Japan. Thinking of you all and sending much love and positive energy. Abby and Anna, you are so brave, so strong! The Schriebers, you are one awesome family! Sending hugs and prayers from the ASIJ Kiosk. Anna, you inspire me! We're holding your whole family close here on the ASIJ campus. Wow! Anna is a powerful hero. I'm deeply moved by the courage and strength each of you share. Speedy and profound healing to Abby and Anna! What a wonderful gift you have given Anna! Know you are a treasure. May your healing be quick and the bond you share with your sister, bring her complete healing.